Tales of travels, feasts, libations, and miscellany, with original cocktail recipes. Do What Thou Wilt. This was my other drink for the Allspice Dram TDN last week. 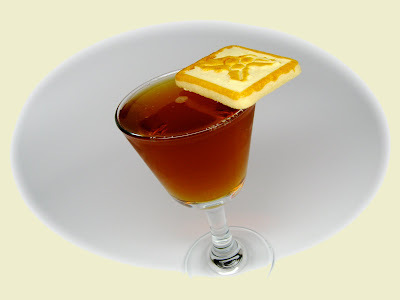 Obviously based on the classic Bobby Burns cocktail, here I cut back on the vermouth and benedictine a bit to make room for the Dram. I mixed this up completely on a whim, and was VERY pleased with the results. It was surprising how well the spice played with the smoke from the scotch and the herbal flavors from the vermouth and benedictine, and the other ingredients had plenty of heft to not be dominated by a full half ounce of the St. Elizabeth's, which is more strongly flavored than most homemade Drams (I'm told). This might even be an actual improvement on the classic it was based on. The name derives from the name of the base recipe and the well known character from The Simpsons, Mr. Burns would be old enough the be Bobby's brother, or maybe even father, right? This was my favorite of the night! The dram worked well with the smoke and the malt (I was surprised how it worked well with Genever's malt as well in Greg Boehm's drink). Thanks for creating it! 1. (in Rabelais' Pantagruel) the huge son of Gargantua, represented as dealing with serious matters in a spirit of broad and somewhat cynical good humor. Pork Secreto for sale at The Meat Hook!